2. Brooks Orpik, Pittsburgh Penguins, D, 309 hits -- He's big and he's mean, so you better have your head on a swivel, especially along the boards. Orpik has reined in his penchant for penalties while increasing the number of legal hits he dishes out each year. Orpik's physicality was a big factor in Pittsburgh's Stanley Cup championship. 3. Dustin Brown, Los Angeles Kings, LW, 285 hits -- The Kings' captain set the record of 311 hits when he led the NHL a year ago. He was second with 258 hits in 2006-07 and 13th in 2005-06 with 175 hits. He's solidly built at 6-foot, 207 pounds and leads his team by example. 4. Ryan Callahan, New York Rangers, RW, 265 hits -- Callahan hit career highs with 22 goals and 40 points and has endeared himself to Rangers' fan with his unflagging energy and bone-jarring checks. The team signed him to a two-year contract this season and the U.S. Olympic team invited him to their summer evaluation camp. 5. Matt Cooke, Pittsburgh Penguins, LW, 262 hits -- Putt-putt-putt-bam. Neither fast nor overly skilled, Cooke has fashioned a 12-year NHL career by constantly checking, standing up for teammates and putting up a career plus-19 record while shutting down top offensive players. One of the best at catching opponents with their head down. 6. Milan Lucic, Boston Bruins, LW, 262 hits -- In his second season, the Bruins' left winger improved by 9 goals and 15 points and improved to plus-19. At 6-foot-3 and 228 pounds, Lucic is built to intimidate. Lucic has quickly become one of the most controversial and disliked (by opponents) players in the NHL. 7. Brandon Dubinsky, New York Rangers, C, 251 hits -- He comes from a nice family and had every advantage -- why is this 23-year-old so angry? Dubinsky smashes sticks when he loses faceoffs. He transfers that burning desire to win and a quick fuse into an energetic game that is hard to keep up with. Getting better and better and may center the first line this year. 8. Evgeny Artyukhin, Tampa Bay Lightning, RW, 249 hits -- Most NHL players wish the Russian giant had stayed home after leaving Tampa Bay two years ago. But no, he returned and used his 6-foot-4, 254-pound body to rub opponents along the boards and grind them down. He came back because Russian referees cracked down on his style of checking. This season, he'll play for the Anaheim Ducks. 9. Alex Ovechkin, Washington Capitals, LW, 243 hits -- The Art Ross Trophy winner is the only player on this list among the top 85 players in scoring last season. That all-round play is what makes him the best player in the NHL. 10. Tuomo Ruutu, Carolina Hurricanes, RW, 228 hits -- The 26-year-old has paid a price over the years for his rugged play, missing 86 of a possible 410 games, or 21 percent. 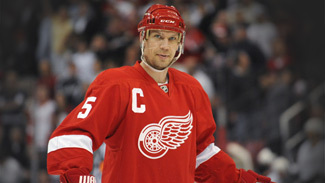 But he had career highs this past season with 26 goals, 28 assists and 54 points. He is the second-highest scoring player on this list. For the first time in the four seasons that the statistics have been kept by the NHL, both the leader in hits and the leader in shot blocking did not lose a game to injury. Phoenix Coyotes defenseman Zbynek Michalek led the NHL with 271 blocked shots and played 82 games. 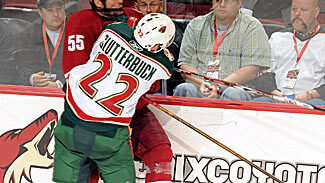 Minnesota Wild rookie forward Cal Clutterbuck led with a record 356 hits and played 78 games. Clutterbuck was promoted from the AHL for the Wild's third game last season and was a healthy scratch for two games, Nov. 29 and Dec. 1, to give players returning from injury a chance to gain back their jobs. They didn't, and Clutterbuck played every game the rest of the season. Not only that, his ice time dramatically increased. Clutterbuck was asked if that was a case of gaining the coach's confidence. "I think so," Clutterbuck said. "At the start, I was coming in to be a temporary replacement, a fourth-line call-up kind of guy. I was upset that I didn't make the team out of training camp. I thought I had a chance and I was disappointed. I made sure when I came up that I did my best and tried to make an impact. "Around the time of my 20th game, there were some guys who had injuries, some guys who made the team originally, and they were still around and being healthy scratches. I wasn't getting sent down. It was just a way of giving them another chance that they thought they deserved, early in the season. With the consistency I was showing, I gained a role on the third line, preventing other teams' top lines from scoring, as opposed to being a fourth-line energy guy. "I had been on the energy line, but I got a chance to move up because of some injuries. I went on the third line with Eric Belanger and Stephane Veilleux and that's how it remained for most of the final 50 games. Things went well on that line and the coach realized we had good chemistry." Clutterbuck is well built for the job at 5-foot-11 and 215 pounds. He averaged 4.5 hits per game, with a high, and Wild record, of 10 hits in an overtime loss to the San Jose Sharks in St. Paul. Two weeks later, he had another big night. Clutterbuck registered seven hits, March 25, in a 6-2 win against the Islanders at the Nassau Coliseum to break Los Angeles Kings left winger Dustin Brown's record of 311 set last season. Brown finished third this past season with 285 hits. "With hits, you don't know how many they credited you with until after the game," Clutterbuck said. "So, I broke the record on my first shift, but didn't know it until after the game. I was pretty excited and I thought it was pretty cool to have an NHL record. My goal before this past season was to play a few NHL games, especially after I was sent down early to Houston, so setting a record was over and above my expectations. I thought I'd be a utility player in my first NHL season, just come in when they needed me." Surprisingly, for a guy who hurled himself into other bodies 356 times, Clutterbuck had only 76 penalty minutes in 78 games. That's good discipline for a physical player. "A big part of my game is trying to get other people to take penalties," Clutterbuck said. "It's hard to frustrate your opponent if you yourself are being penalized. Then, they say you're undisciplined. Staying disciplined, staying out of the penalty box, is something that I'm focused on. The coach doesn't have to tell me that. I've played that way since minor hockey." Clutterbuck said he expects his role to remain the same under new coach Todd Richards and General Manager Chuck Fletcher. He credited former coach Jacques Lemaire with helping him develop and said he had a good conversation with Richards about his expectations. "I think my game improved tremendously under Jacques Lemaire," Clutterbuck said. "Mostly in just knowing what to do in the NHL because it's a different level from anything in hockey. I needed to be more consistent and I had to learn how do that without wearing down over the season. I learned to treat my body the way I should. And, from my first 20 games, I learned to be more well-rounded in my game. "I've spoken with Todd Richards and Chuck Fletcher this summer and they don't want me to change much. Improvements will come with time, but they don't want me to rush or change anything. There are some little things to work on but in my overall game, there's nothing I want to change. I'm confident if I put in the work, I will improve to the point where I can max out my potential. I'm always evaluating myself and my career and my goal is to keep working as hard as I can to be as good as I can be." Every NHL player remembers his first goal, Clutterbuck remembers his first two, in the same game, and how he outshined one of the NHL's biggest stars in Minnesota's 4-3 victory Nov. 24 over the Washington Capitals. "That was my claim to fame until the Islanders' game," Clutterbuck said. "It was my 16th or 17th NHL game and I hadn't scored yet. When you get called up, you come to terms with your role and realize it would be great if you scored but do the job you're supposed to do and if you score, it's a bonus. "But when you get 17 games into your career and you haven't scored, you're playing a fair amount and your teammates are teasing you. I needed to get the monkey off my back. After scoring those goals, I was more calm in the offensive zone. I had been too anxious, gripping the stick too tight when chances came. I missed a couple of good chances. Meanwhile, I was trying to make sure nothing changed on the other side, the defensive side, of my game."